Submitted by David Walker on 1 April 2019. 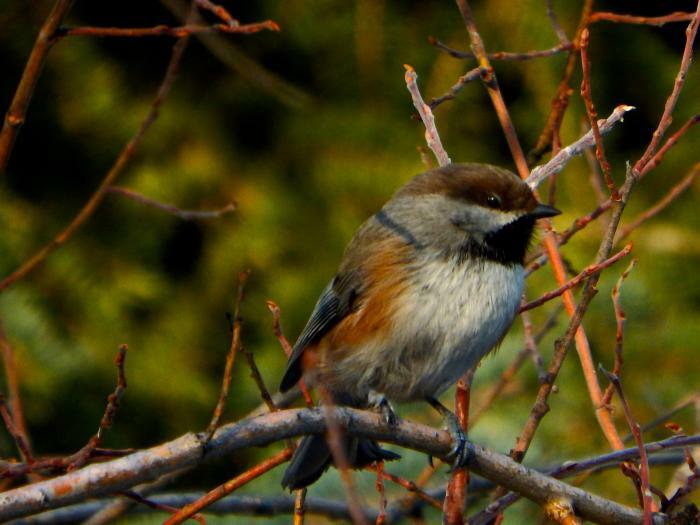 Boreal Chickadee (Poecile hudsonicus). Fairbanks, AK. This week, I'm in Fairbanks, AK for PolarTREC orientation. I'll be getting to meet teachers from around the country, who like me, will be traveling to a polar region (Arctic or Antarctic) to work with field researchers. I'm very excited to meet these teachers and the program coordinators and staff of PolarTREC and ARCUS (Arctic Research Consortium of the United States). This entry is about my first evening in Fairbanks, which I spent on a walk in the woods near our hotel. When I started at 7 PM, it was still very light outside. Most of the ground was covered with ice, and I had to be careful – at one point, I accidentally post-holed and sank into water below the ice up to my knees. The wildlife here is completely new to me. Early in my hike, I was greeted by a small hare, completely white and almost indistinguishable from the snowy backdrop of the Alaskan woods. 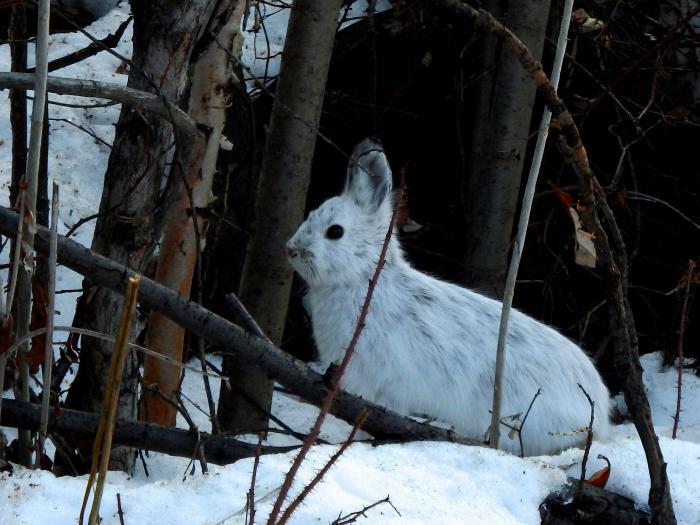 I later showed my photo to Katie Gavenus, a fellow PolarTREC teacher from southern Alaska, and she readily identified this species as a snowshoe hare. This hare's range in restricted to the northern US and Canada, a true specialist of the Alaskan woods. Its name "snowshoe" comes from its large hind feet, which are helpful in preventing it from sinking down into the snow.1 I learned that it in order to blend in with its surroundings, this hare is white in the winter and a reddish brown in the summer.2 Only 5 minutes into my first hike in Alaska, I had already uncovered my first example of evolutionary adaptation to life in the North. Snowshoe Hare (Lepus americanus). Fairbanks, AK. What a great first evening in Alaska. 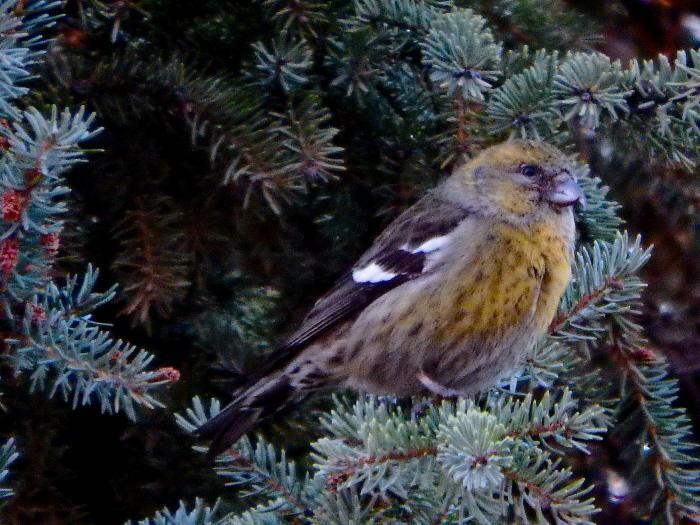 White-winged Crossbill, Female (Loxia leucoptera). Fairbanks, AK. I had a great discussion in the van with PolarTREC Project Manager Janet Warburton about frost heaving. Water is unique in that its solid form (ice) takes up more volume than its liquid form. Accordingly, when soil freezes, the result is expansion, or upward swelling. Freeze-thaw cycles can seriously damage roads built on affected soils, and certain stretches of the roads we drove today were very buckled and warped. I'm pretty sure the folks at the back of the van were thrown against the ceiling on multiple occasions (glad I called "shotgun"). According to Janet Warburton, who has spent over half of her life in Alaska, you can use vegetation patterns to predict locations of frost heaving along a road. Paper birch trees prefer soils that are well-drained, so roads traversing stands of birch as less likely to be affected by frost heaving. Black spruce trees, on the other hand, thrive in more hydrated soils, more subject to frost heaving. Sure enough, I quickly learned to hold on for dear life when a stand of black spruce appeared on the horizon. There is another redpoll species in Fairbanks that looks very similar to the common redpoll I saw earlier today. What is its name, and how do you tell the two Alaskan redpoll species apart? Wow- you may be designated as the wildlife photographer for Orientation 2019! Nice photos (and journal)! Thanks, Judy! I love taking photos, especially of birds. Stay tuned! Love the birds & wildlife, hope to see lots more! RE: Other Redpoll? Hoary Redpoll, which is overall paler & has little or no streaking on the underparts and especially on the undertail coverts. When I was at the orientation years ago I patrolled the nearby neighborhoods and found a yard with feeders. They had lots of redpolls including a few Hoarys, but apparently there are years with many and years with nearly none, even as far north as Fairbanks. Congrats and best of luck on your expedition! The enigmatic hoary redpoll! Thanks for the comment, Bill, and nice to virtually meet you. Lots of redpolls in the woods near UAF here in Fairbanks, but I think all of the ones I've been seeing have been commons. Although the commons definitely vary in terms of their streaking, so it's really tough to tell. I'll take your tip and try some neighborhood hikes this evening! Hi, your pictures are fantastic. This is all very fascinating! I was wondering if you team is planning on measuring the levels of the recently discovered compound, cyclomethane, in the permafrost. Recent studies have shown that it may have a vital role in our planet’s carbon cycle. I look forward to your next update. Thanks for the comment, Anonymous. Despite the efforts of LASA High School students to convince me otherwise, I still don't believe that cyclomethane exists. But hey, maybe it has been hidden in the permafrost this whole time! David, great first post. The story is interesting and photos are nice to look at. The Arctic fact and question of the day and the detailed footnotes add a lot to the story. You might not use these for all posts, but this is a great start. Here's to adding lots of birds to your list! Thanks, Regina! I'm so lucky to have you here in Fairbanks this week as a resource. I look forward to working with you this year both before and after my field expedition. These pictures are amazing! I'm looking forward to the great ones to come! Thanks, Ale! Yes, I hope to post many photos of plants and animals. Analyzing photos helps me learn to identify things more readily in the field -- my attempt at simplifying the overwhelming! Great photos and blog! Love your description of frost-heaving. Thanks, Dr. Cory! I can't wait to join your team at Toolik in June. Great photos, Dave! Looking forward to more photos of birds this summer.